This Sign Hanging Kit Utilizes Ceiling Space! 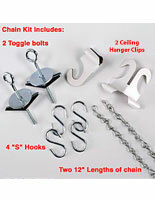 Browse our website for additional hanging kit options. Purchase your sign hanging kit today! 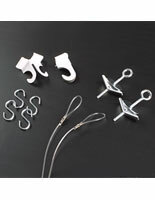 The ceiling hanger clips are for use on suspended ceilings. The toggle bolts are used for sheetrock or plaster and lath ceilings. 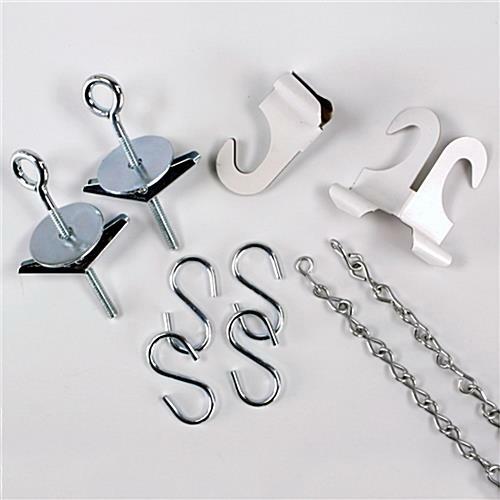 These sign hanging kits are a great alternative to cheap plastic frames, or heavy metal frames. These poster hanger packages are very easy to change, easy to hang and are excellent marketing displays. Many companies are opting for these ceiling mount sign hanging kits rather than wall mount frames to capture the attention of customers. By having these picture hangers suspended from the ceiling, it allows other signage or advertisements to be mounted on the wall. Large department stores, and grocery stores use these sign hanging kits to advertise new products, or as a method of keeping customers informed of specials and store layout. If a longer hanging length is required for your banner, select one of our other sign hanging kit sizes.